Given the new Brexit deadline means it looks likely the UK will be taking part in the European elections for MEPs, here's where the Island parties stand. Four Isle of Wight women joined 1,000+ others at the first stand-alone Women’s Conference arranged by the Labour Party in 20+ years and an Island Labour motion was chosen to go to the National Conference. The Isle of Wight MP spoke in Parliament yesterday on the issue of Brexit, stating that if it is not delivered they will be in "contempt of the British people". 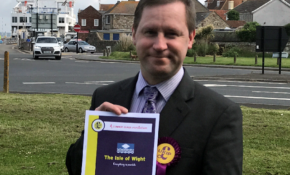 Here's the Isle of Wight MP's full explanation as to why he's supporting Theresa May's Brexit deal, plus we've got the reaction of the leaders of other Isle of Wight political groups. Island Labour chair, Julian Critchley says "it's the wealthiest 10% of the population who benefit, while the rest of us continue to be squeezed". The way the Isle of Wight votes in national elections will undergo a major change if this morning's Final recommendations by the Boundary Commission are accepted. Each proposal has seen changes.